Reconstruction, the era immediately following the Civil War and emancipation, is full of stories that help us see the possibility of a future defined by racial equity. Yet the possibilities and achievements of this era are too often overshadowed by the violent white supremacist backlash. Too often the story of this grand experiment in interracial democracy is skipped or rushed through in classrooms across the country. Today—in a moment where activists are struggling to make Black lives matter—every student should probe the relevance of Reconstruction. Our campaign aims to help teachers and schools uncover the hidden, bottom-up history of this era. 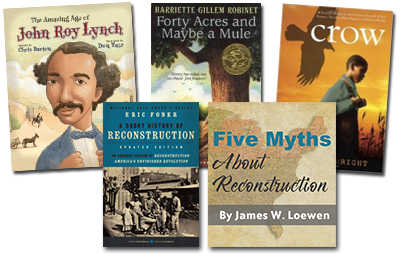 We offer lessons for middle and high school, a student campaign to make Reconstruction history visible in their communities, and an annotated list of recommended teaching guides, student friendly books, primary document collections, and films. This campaign is informed by teachers who have used our Reconstruction lessons and a team of Reconstruction scholars. This role play engages students in thinking about what freedpeople needed in order to achieve—and sustain—real freedom following the Civil War. It’s followed by a chapter from the book Freedom’s Unfinished Revolution on what would happen to the land in the South after slavery ended. ▸ Read more teacher comments. 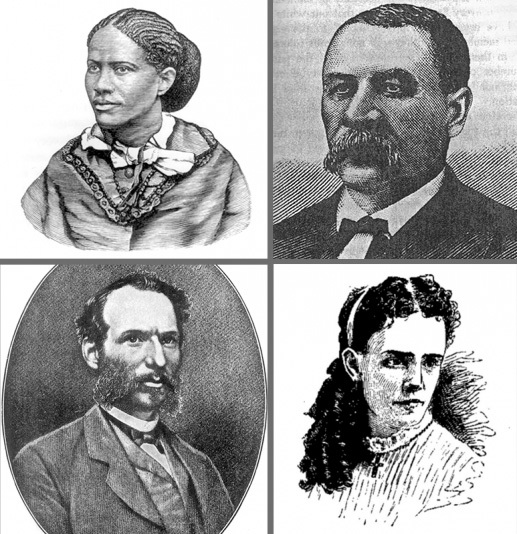 Clockwise: Frances Harper, Isaac Myers, William Sylvis, and John Roy Lynch are a few of the people featured in the role play. 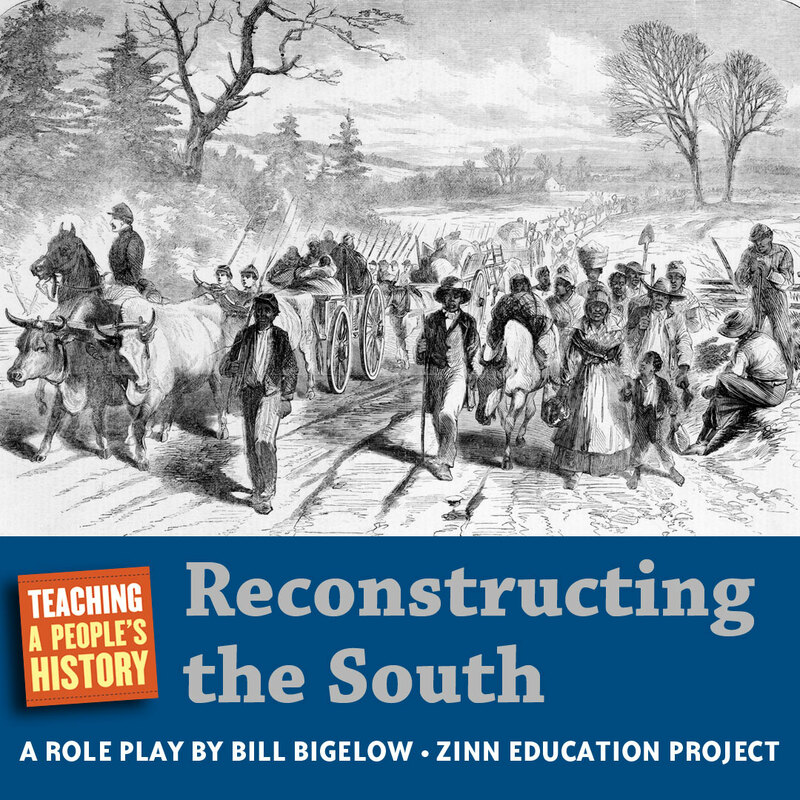 A mixer role play that explores the connections between different social movements during Reconstruction, introducing students to individuals in the labor movement, women’s rights, and voting rights movements that followed the Civil War and their attempts to build alliances with one another. The “Make Reconstruction History Visible” mapping project is an opportunity for students and teachers to identify and advocate for recognition of Reconstruction history in their community. This helps students learn about this vital era in U.S. history while also playing an active role in giving visibility to an era that has been hidden or misrepresented for too long. For this project, students (individually or as a class) identify and document Reconstruction history such as schools, hospitals, election sites, Freedmen’s Bureau offices, Black churches, Black newspapers, Black owned businesses, prominent individuals, organizations, key events, and more. Learn how to participate. From the urban rebellions to the salute at the Olympics, commemorations of 1968 — a pivotal year of Black Power — have appeared in news headlines throughout this anniversary year. Yet 2018 also marks the 150th anniversary of 1868 — the height of Black Power during Reconstruction. Read more. 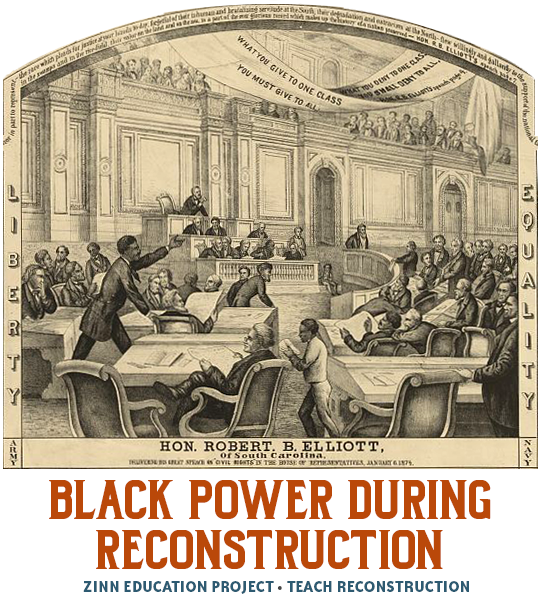 Readings, primary documents, and films for classrooms about the Reconstruction era. 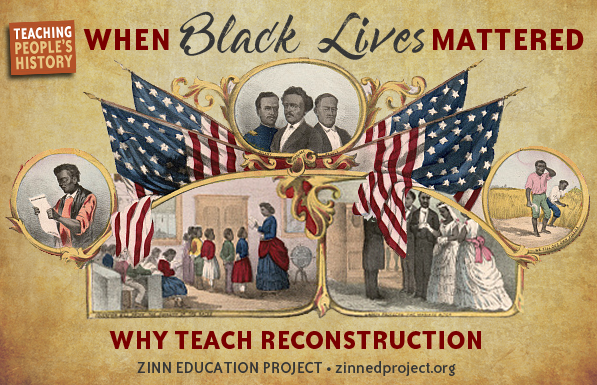 The Teach Reconstruction campaign is made possible by donations from individuals. Please contribute today so that more teachers receive free lessons on Reconstruction history and more students can participate in the Make Reconstruction History Visible project. Donate now! Shawn Leigh Alexander is an associate professor of African and African American Studies and the director of the Langston Hughes Center at the University of Kansas. Alexander is the author of An Army of Lions: The Struggle for Civil Rights Before the NAACP, and editor of Reconstruction Violence and the Ku Klux Klan Hearings. David Blight is a professor of American history at Yale University and the director of the Gilder Lehman Center for the Study of Slavery, Resistance, and Abolition at Yale. Blight is the author of several books including A Slave No More: Two Men Who Escaped to Freedom and Race and Reunion: The Civil War in American Memory. Gregory Carr is associate professor of Africana Studies, chair of the Department of Afro-American Studies at Howard University, and Adjunct Faculty at the Howard School of Law. Carr is co-founder of the Philadelphia Freedom Schools Movement. Gregory P. Downs is an associate professor of history at the University of California, Davis, and the author of After Appomattox: Military Occupation and the Ends of War. Downs is also the co-author of the National Parks Service’s Theme Study, The Era of Reconstruction 1861-1900. Jim Downs is professor of history and the interim director of the American Studies Program at Connecticut College. Downs is the author of several books including Sick from Freedom: African-American Illness and Suffering during the Civil War and Reconstruction and Beyond Freedom: Disrupting the History of Emancipation which he co-edited with David Blight. Hilary N. Green is an assistant professor of history at the University of Alabama and serves as the co-program director of the African American Studies program. Green is the author of Educational Reconstruction: African American Schools in the Urban South, 1865-1890. Steven Hahn is a professor of history at New York University and the winner of the Pulitzer Prize in History for his book A Nation Under Our Feet: Black Political Struggles in the Rural South from Slavery to the Great Migration. William Loren Katz is the author of numerous books on U.S. history for middle school students, including An Album of Reconstruction. Chenjerai Kumanyika is a researcher, journalist, and artist who works as an assistant professor in Rutgers University’s Department of Journalism and Media Studies. He is also the co-executive producer and co-host of “Uncivil,” Gimlet Media’s podcast on the Civil War. James Loewen is the emeritus professor of sociology at the University of Vermont and the author of several books including Lies My Teacher Told Me, Lies Across America: What Our Historic Sites Get Wrong and The Confederate and Neo-Confederate Reader: The “Great Truth” about the “Lost Cause”. Kate Masur is an associate professor of history and African-American studies at Northwestern University and author of An Example for All the Land: Emancipation and the Struggle Over Equality in Washington, D.C. Masur is also the co-author of the National Parks Service’s Theme Study The Era of Reconstruction 1861-1900. Jeremy Nesoff is associate director for staff development at Facing History and Ourselves. He was a 7-12th grade social studies teacher and administrator for 10 years, in a small New York City public school and a small Vermont progressive independent school. Nesoff has been on staff at Facing History for more than 10 years. Among his roles is leading work connected to the curriculum unit The Reconstruction Era and The Fragility of Democracy. Paul Ortiz is the director of the Samuel Proctor Oral History Program at the University of Florida. Ortiz is the author of Emancipation Betrayed The Hidden History of Black Organizing & White Violence in Florida from Reconstruction to the Bloody Election of 1920 and An African American and Latinx History of the United States. Tyler Parry is an associate professor in African American studies at California State University, Fullerton. He studies slavery, the African Diaspora, and the Atlantic world, and is the author of “Black Radicalism and the ‘Tuition-Free’ University,” an article exploring the profound impact South Carolina’s majority Black Reconstruction era legislature had on public education. David Roediger is the foundation professor at the University of Kansas. He is the author of several books on race and class in the United States including Seizing Freedom: Slave Emancipation and Liberty for All. Mark Roudané is a retired early childhood teacher. He is dedicating his life to documenting and sharing the history of his great, great grandfather, Charles Roudanez, who founded the New Orleans Daily Tribune, the first daily Black newspaper during Reconstruction.